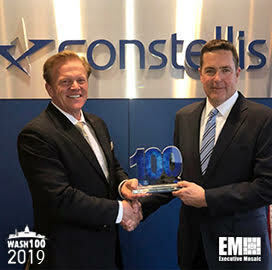 Jim Garrettson, founder and CEO of Executive Mosaic, presented Tim Reardon, chief executive officer of Constellis, with his third Wash100 Award on Tuesday. Executive Mosaic recognizes Reardon for his leadership and experience in the defense and intelligence industries creating organic growth for several companies. We are proud to present the most coveted award in government contracting to Reardon. Reardon joined Constellis as CEO in August 2018. Previously, he was the president of defense and intelligence for Leidos beginning in August 2016. Reardon served Lockheed Martin in multiple senior executive roles for over six years. Earlier, he worked as an officer for the Central Intelligence Agency focusing on high priority national security issues. Reardon earned a bachelor’s degree from the University of Virginia and a master’s degree from George Washington University.